We've got 59 of them! Here's a list of our pavilions. You can book them online. Do you like swimming? We do! That's why our pools are so great! Softball, Basketball, Pickleball, Kickball, Horseshoes, etc. Sign up for classes, make payments, book facilities and more! Now with interactive links to take you straight from the document to register in WebTrac! In Bryan, we say that we have The Good Life, Texas Style. Part of the reason is because we believe Bryan is a great place for families and kids. We have cool parks, innovative recreational programs, and camps to challenge kids of all ages. 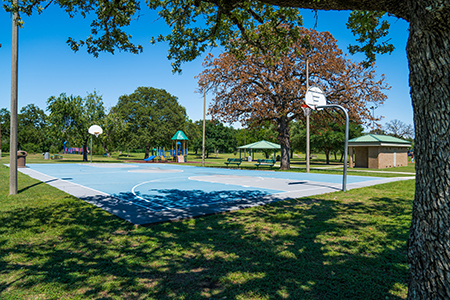 Our parks system covers 51 properties totaling 600 acres and continues to expand with new green space development. But it’s what we do with that turf that’s amazing: Sure, we have a bounty of baseball and soccer fields, but we also have inline hockey rinks, skateboard parks, splash pads, walking/hiking trails, two dozen pavilions for picnicking and reunions, and four terrific pools. You’ll even find the unusual: We have a tremendous number of horseshoe pits for amateurs and pros alike. Even handicapped-accessible pits are easy to find. An indoor tennis facility? Ours is the only one in the region. We even make sure our annual Holiday Magic event features a snow hill for our powder-deprived residents. And a family camp out in a park? Yep, under the stars, by the campfire and making s’mores. You can be anything you want to be in Bryan. Except bored.